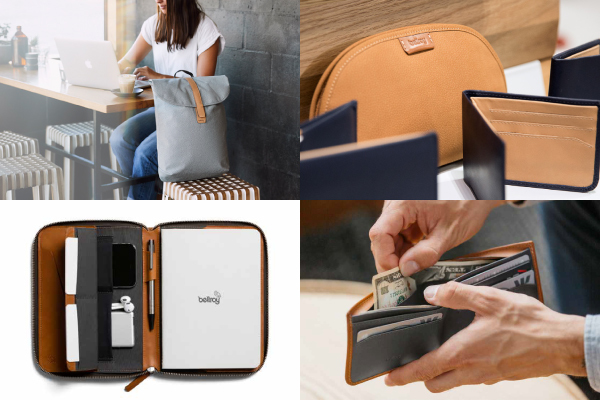 DKSH Business Unit Consumer Goods has partnered with Bellroy, an Australian lifestyle brand, to exclusively supply, market, sell and distribute their products in Japan. Tokyo, Japan, January 30, 2019 ― DKSH, the leading Market Expansion Services provider with a focus on Asia, has partnered with Bellroy to exclusively promote and distribute its lifestyle products in Japan. DKSH with its longstanding experience and in-depth knowledge will offer its full support from logistics to marketing and sales to help the leading lifestyle brand from Australia drive growth in the Japanese market. Bellroy was founded in Australia in 2010 by a group of product designers and creatives. The name represents the two Australian locations the brand calls home: Bells Beach, a world-renowned surfing destination, and Fitzroy, a creative inner-city hub. From these two offices, they develop modern lifestyle products, such as wallets, bags and work accessories, which combine functionality with a flawless minimalist style. Striking the perfect balance between aesthetics and functionality, Bellroy products are popular among customers for both work and leisure. Bellroy’s signature products include slim leather wallets, such as the “Note Sleeve” and the “Slim Sleeve”. The slim design of Bellroy wallets reduces bulk and features storage for flat bills and quick-access slots for daily cards. This minimalist and clever design philosophy can be seen throughout the rest of the Bellroy product range, from wallets to backpacks, tote bags and more. Bellroy was founded in 2010 in Melbourne, Australia, with a mission to help the world “carry better”. What started with one slim, leather wallet now includes a wide range of products such as bags, phone cases, work folios and more. They are certified as a B Corp, using the power of business to help solve social and environmental problems. They constantly pursue better ways to source leathers, reduce impact on the environment and donate a portion of revenue to effective charities. DKSH Business Unit Consumer Goods is Asia’s leading Market Expansion Services provider with a focus on fast moving consumer goods, food services, luxury goods, fashion and lifestyle products as well as hair and skin cosmetics. The Business Unit’s comprehensive Market Expansion Services extend from product feasibility studies and registration to importation, customs clearance, marketing and merchandising, sales, warehousing, capillary physical distribution, invoicing, cash collection and after-sales services. With 700 business locations in 22 markets and around 18,340 specialized staff, Business Unit Consumer Goods serves 310,000 retail outlets on a daily basis and generated net sales of CHF 3.6 billion in 2017.